Andy Murray will face lucky loser Alexander Bublik in his opening match at Wimbledon 2017, and new Coral customers can back Andy Murray to win his first match @ 25/1, plus £5 free bet if the Scot fails to win his first match at SW19! Despite concerns over Andy Murray's form and fitness, online bookmakers fully expect the defending champion to advance to the second round. Murray is normally backable at 1/20 but you can get a terrific 25/1 boost! Join Coral from now on to the start of the tournament for 25/1 Andy Murray to win his first match Wimbledon! What a bargain! Make your first deposit of £5 or more and your enhanced odds will appear on home page - 25/1 Andy Murray to win his first match Wimbledon! Coral are offering all our readers a MASSIVE 25/1 for Andy Murray to beat Alexander Bublik at Wimbledon 2017, click here to request the massive bargain in a few simple steps! Offer open to new online coral.co.uk customers aged 18+ who are resident in any country where the promoter accepts customers. Open a new Coral online or mobile account and bet on Andy Murray to win his first match a match in Wimbledon 2017 – 25/1. 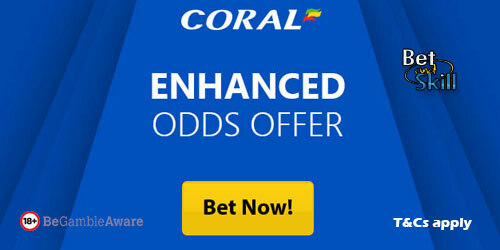 Offer available to UK & Republic of Ireland residents aged 18 years or over opening a new Online, Mobile or Coral Connect account in either £/€ currency through https://promotions.coral.co.uk/landing-pages/crazy-prices2, https://promotions.coral.co.uk/landing-pages/crazy-prices-online2 or the specific offer promotion box from coral.co.uk/sports/offers between 08:00 BST Thursday 29/06/2017 until 13:00 BST Monday 03/07/2017 with the exception of new accounts depositing funds with Moneybookers, Paysafe, Neteller or Skrill. Place your FIRST real money bet as a win single £/€1 on ‘Murray to win his first match a match 25/1’ in our “My Markets” sections. "Coral offer 25/1 Murray to win vs Bublik at Wimbledon 2017 + £5 free bet"